The Bank Al-Maghrib is the central bank of the Kingdom of Morocco. It was founded in 1959 as the successor to the "Banque d'Etat du Maroc" (est. 1906). In 2008 Bank Al-Maghrib held reserves of foreign currency with an estimated worth of USD 36 billion. In addition to currency management, the Bank Al-Maghrib also supervises a number of private banks supplying commercial banking services. The Bank has a branch in Casablanca, and agencies in 18 other cities in Morocco. The current governor is Abdellatif Jovahri. The Bank is a member of the Alliance for Financial Inclusion and active in promoting financial inclusion policy. The Algeciras Conference, which took place in early 1906 in Algeciras, Spain, sought a solution to the First Moroccan Crisis of 1905 between France and the German Empire, which arose as Germany attempted to prevent France from establishing a protectorate over Morocco in what was known as the Tangier Crisis. The participants at the conference also sought to reform the Kingdom of Morocco's administration and finances, and to ensure free trade. On 7 April 1906, the representatives of 12 European countries joined Morocco and the United States of America in signing an agreement to establish the "Banque d'Etat du Maroc". The bank began operations in Tangier in February 1907 and had as its shareholders the signatories of the agreement, except for the United States. The Banque d'Etat du Maroc had some of the functions of a central bank and in 1911 it started to mint silver coins ("Hassani"-type), and to issue banknotes. It had the right, for a 40-year term, to issue banknotes backed by gold. It had a strict cap on the spending of the Sherifian Empire, and the national banks of the German Empire, United Kingdom, France, and Spain, which guaranteed the Banque's loans, appointed administrators. Spanish coinage continued to circulate. France subsequently bought out the shares of some of the founding owners to acquire majority control. By 1919 it became impossible to maintain a fixed parity between the Hassani and the French currency, both of which were circulating in Morocco, and in October the Banque gave up the fixed exchange rate. In March 1920, the Banque demonitized the Hassani currency. Instead, it issued notes and coins denominated in the Moroccan franc. An operations account ensured that from December 1921 the Moroccan and French francs would trade at parity. In 1946 the Banque received an extension for 20 years of its right to issue money. However, in 1958, the Moroccan government commenced negotiations with France and the Banque to reclaim for itself the right to issue money. Decree n° 1.59.233 of 30 June 1959 created the Banque du Maroc, which took over the issuance of money the next day, and replaced the Banque d'Etat du Maroc. In October, the Banque du Maroc issued a new currency, the dirham. 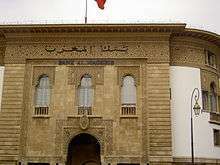 The Banking Act of 21 April 1967 enhanced the role of "Banque du Maroc", particularly in the field of banking supervision. In 1974, the Banque du Maroc commenced issuing the centime as a fraction of the dirham, replacing the franc. In March 1987, the bank adopted the name Bank Al-Maghrib. That same month, the bank established Dar As-Sikkah, the unit that would be responsible for printing bank notes and minting coins. A new banking act in July 1993 created a unified regulatory framework for all credit institutions. This act strengthened the Bank Al-Maghrib in its role of regulating and supervising credit institutions in Morocco. October saw the passage of amendments to the Bank's statutes that clarified its role in monetary policy, and that granted it greater autonomy. In 2006, Law No.76-03, promulgated by Dahir No. 1-05-38 of 20th Chaoual 1426 (23 November 2005) repealed Dahir No. 1-59-233 of 23rd Hija 1378 (30 June 1959), which had created Bank Al-Maghrib. The new law reinforced Bank Al-Maghrib's independence in terms of monetary policy, and provided a legal basis for its responsibility for the payment system. The new law established the bank as a public legal entity, controlled by the account commissioner, the government commissioner, and the Court of Account. Law No.34-03 expanded the jurisdiction of the banking law over certain institutions engaged in banking activities, redefined the roles of the National Council of Credit and the Committee of Credit Establishments, reinforced Bank Al-Maghrib's autonomy in banking supervision, and instituted a number of other measures covering the protection of clients of credit institutions and the treatment of credit institutions in distress. ↑ "Official Site of Bank Al-Maghrib".